Macco Law Group, LLP is a nationally recognized law firm, which has maintained its roots in Suffolk County since its inception in 1984. Michael J. Macco is one of the founding partners. Mr. Macco has built a highly regarded law firm, catering to the needs of a varied clientele, ranging from national corporations, small businesses and their owners, start up businesses, individuals and their families. 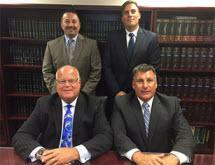 The firm proudly serves Suffolk and Nassau Counties, and boroughs of New York City. At Macco Law Group, LLP, we provide consumer and business debt relief and/or reorganizations, that will cease collection and foreclosure proceedings and stop creditor harassment. Let us provide you with exceptional legal counseling to help make your situation easier to handle.